Life Down Our Lane: Don't blink or you will miss it! I am still a little bit in denial that my baby girl is in Pre-Kindergaten this year at school. 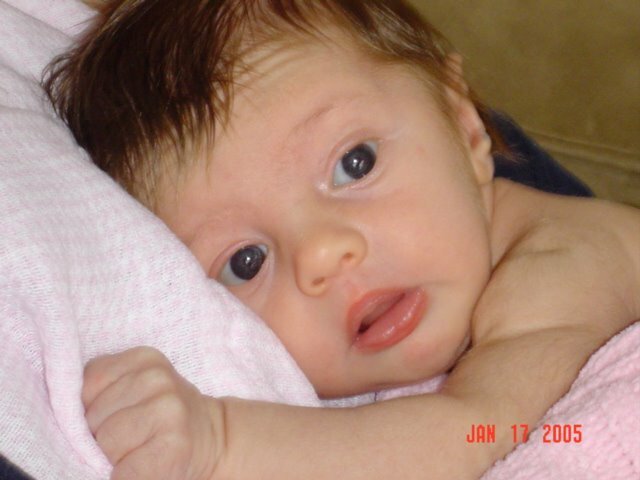 It seems like only yesterday that she was this tiny little baby with the head full of black hair. Now she is such a big girl. There are so many things that I love about her! We usually listen to K-LOVE in the car on the way to school and usually very loud. Lately it has been fuzzy and we've had to shut it off. So yesterday, I said "Oh man, we're losing our channel again!" Gracie's response was "Oh man, I wanted to rock!!" She helps mommy get things for Gauge. She helps me feed him. She loves to help with the laundry. She helps feed our dog. She helps set the table for supper. She will sometimes color a picture for a friend at school. She prays for her brother. Lately at supper this is her prayer "God is good, God is great, thank you for our daily bread. Also please touch bubby's little finger and help him to stay away from the stairs so he doesn't get hurt. Amen"
The topic at school this week has been "About Me." Her project was to decorate a white paper sack and then fill it with some of their special possessions. She also had a paper she had to glue family pictures on. 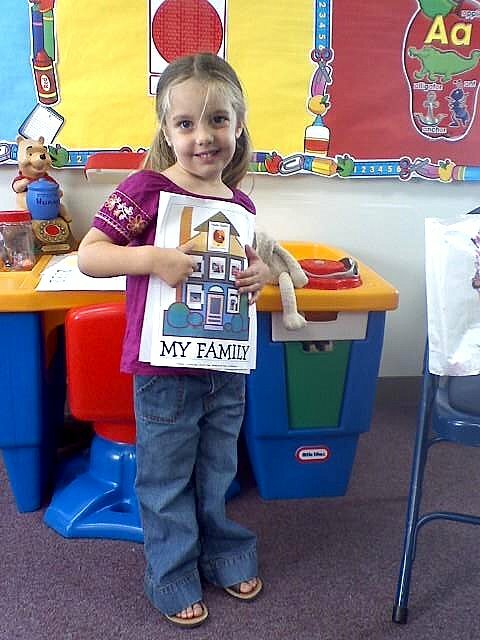 On Thursday it was her turn to get up in front of the class tell about her things and show everyone who is in her family. Her sweet teacher texted me this picture. I am so blessed to have Grace in a school that teaches her the word of God. I am also blessed to know that they love her so much! When I received this picture on my phone I instantly teared up. As a mom you want the world to see and treat your child the way that you do...with love. And it's just awesome when you see it in action. I work in our church office. Grace's classroom is just down the hall. Whenever her class walks by, her teacher lets her come in for a hug and a kiss. Like I said....I AM BLESSED BEYOND MEASURE! OMG...she looks just like you in this pic! Her eyes! This is a great flash back, too! How very sweet - what a great girl! How precious! She looks like such a sweet little angel! You ARE blessed! They do grow so fast! Jamison just turned 5 yesterday and I can't believe it. Treasure each moment!